Mahanandi is located around 12kms away from Nandyal town in Kurnool district. It can be reached from Ananthpur via Tadipatri and Nandyal or on the reverse direction from Srisailam, via Giddlur, to Nandyal. Another route can be vide Gooty, Yaganti and Nandyal from Bangalore on NH 7. The temple is located literally at the foot of the hills of Srisailam forest, naturally the locale is filled with scenary. The temple has three enterance and a ticket counter is located at the main enterance of the temple. The temple is closed between 1 to 3.30 Pm, one has wait for it to open. In the meanwhile one can check out the Nandi temples and other minor temples located in and around the place. This main shiva shrine has a linga which is known as swayambu Linga, which is in the natural form, maybe found in the river bed. 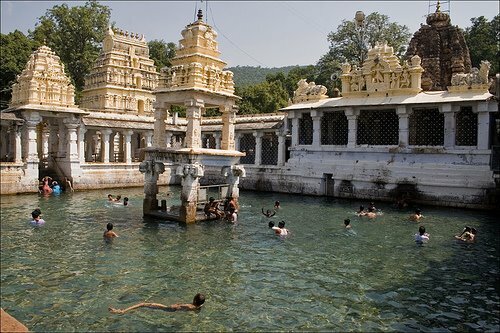 The pond within the temple premise is known as Rudra Kunda, where the devotees bathe with great devotion and gaiety. There is a small mantap at the centre with a Linga embedded. Rasa Siddha is said to have built the Vimana and for wages he made the workers set up sand mounds, which he converted into wealth by his power. Proof of this is seen on the main gate of the temple facing the west. A copper plate by Krishandevaraya states that Mahanandi is one of the sacred places where the king`s brother Simha Deva Raya gave valuable gifts. The Sthalapurana states that Nanda ruled over Navanandis where Mahanandi is situated. The king once thought to anoint the idol and perform abhishek with milk. Herds of cows were brought in which included a black cow. This cow gave a lot of milk and was allowed to travel freely and graze in the forest. The cow always seemed to take far longer in the forest than usual and the milk supply seemed depleted when she returned. One day a cowherd followed the cow and found her grazing around an anthill and then she stood right over it letting the milk flow over the anthill. From it a young child emerged said to be Lord Krishna, after which the cow returned. The next day the king followed the cow and, hid in a bush expecting to catch a glimpse of the Lord. The cow arrived and circled the anthill, Krishna appeared and accepted the offering. The king in surprise moved forward, scaring the nervous cow, who stepped on the anthill in fright. The child disappeared, the hoof print remained on the anthill. The king realizing his mistake prayed for forgiveness and the Lord ordained the anthill after it dried would become a Swayambhu linga at Mahanandi. The two signs are still visible on top of the Linga. Architecture: The temple is at the foothill where a mineral spring flows into the fields from underneath the linga, into the tank in front of the temple. The temple is surrounded by mantapas on all sides. The Vimana over the sanctum is in Nagari style. It has a Shikara at the top. The architectural peculiarities show that the temple dates back to ancient times and it was repaired and rebuilt through the ages by many kings. This temple is famous for its curative powers found in the warm tepid mineral water found in the tank in front of the temple. It is a sixty feet square with a mantapa in the centre. The inlets and outlets of the tank are so arranged that the depth of the water remains constant at five feet for the devotees to swim in. The source of this water has never been traced. The water is said to come from five springs called Srisailadhara, Narasimhadhara, Daivodhinidhara, Nanditirtha and Kailasatirtha. The sanctum contains a linga and is made from a rough uncut rock, with two sockets. Here the linga is seen just above the earth`s surface without the three Peethams underneath. All can touch and worship the Lord. A huge Nandi is at the front of the shrine and hence it is called Mahanandi Tirtha. The tank that lies behind is known as Rudra gundam and there are two more tanks called Vishnu gundam and Brahma gundam. Close to the main shrine is a shrine dedicated to the Goddess. The Srichakra in front of the deity is said to have been installed by Adisankara himself. The popular belief is that if one meditates upon the God then he will receive a darshan befitting his status in front of the mother. The mukhamantapa of the goddess is a recent construction. Festivals: The Sivarathri is the most important festival. In the Kartika masa, pilgrims worship in the shrine of Mallikarjunaswamy and then at the shrine of Padma Nandi, which is two miles further ahead. They then go to the Naga Nandi that is a mile to the west, and then proceed to Brahma Nandi, Soma Nandi, and Siva Nandi, which are all nearby. They move on to Krishna or Vishnu Nandi, three miles to the northeast and from there complete the pilgrimage by worshipping Vinayaka Nandi, Maha Nandi, and Surya Nandi. The traditional belief is that the worship of these Nava Nandis should be finished in a day before sunset. The other festivals like Dasara, Ugadi etc. are also important.